Figure 1. This graph depicts the four planting date mean seed yields, averaged over the 14 cultivars and four replicates, in 2003 and 2004. A linear regression analysis indicated regression coefficients, which reflect the reduction in seed yield that occurred per day of delay in planting date in each year. When I ask producers when they usually begin corn planting, most of them will give me a specific date, for example, April 15. When I ask then the same question about soybean planting, they almost invariably say "When I get done with my corn planting." These producers need to recognize the yield penalty that accrues with that attitude. Research conducted by UNL and funded by the Nebraska Soybean Board shows that when soybean planting is delayed until after May 1, soybean yield decreases. That yield decline can range from about one-quarter (0.25) bu/ac to about 5/8 (0.625) bu/ac, depending on the year for each day planting is delayed after May 1. For example, if you plant on May 16 instead of May 1, your soybean yield potential will decline by as little as 4 bu/ac (16 x 0.25) or as much as 10 bu/ac (16 x 0.625). Multiply those potential losses by the market price of soybeans and you can easily see delays can lead to a substantive loss in potential gross revenue. 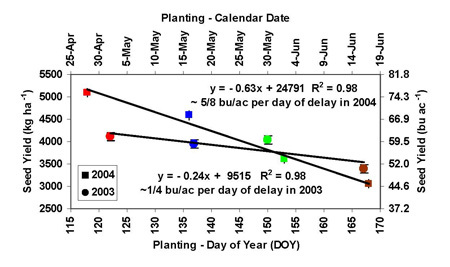 Figure 1 shows how the yield loss is linear over planting dates. 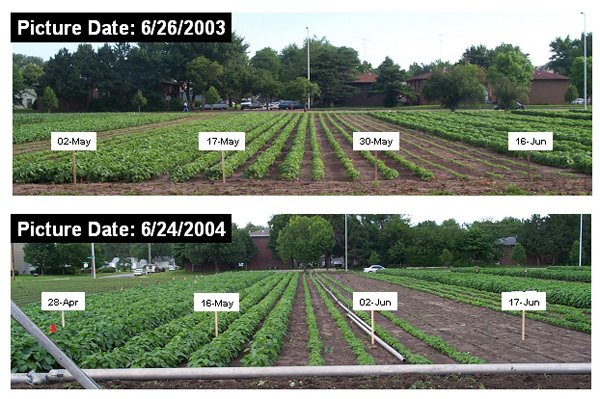 Now take a look at the pictures of soybean strips that were planted (see plot signs) in early May (or late April), mid-May, late May (or early June), or late June in 2003 and 2004 on the UNL East Campus. The pictures were taken in both years just a few days after the longest day of the year (i.e., summer solstice). You can easily see that the earlier the soybean planting, the earlier (in the year) canopy closure occurs. You want to ensure that the soybean crop collects all the sunlight it can, simply because sunlight is the energy the plant uses to reduce the carbon in CO2 into the carbon the plant uses to make carbohydrate, protein, and oil. As a producer, your goal is to plant early enough to have the crop look Aall green to the eye by the 4th of July" (i.e., canopy intercepts all light – no light falls on the ground). With an earlier planting, your crop not only starts collecting sunlight earlier, the crop begins to collect nearly all of that sunlight quicker because canopy closure is sooner. Moreover, when sunlight is not intercepted by leaves, it is intercepted by the soil surface, leading to evaporative water loss from a warmer soil. By lessening the amount of soil water lost to evaporation, more of that water (indeed the water you were saving by using no-till management) goes to your crop for transpiration. Our research also showed that soybean plants add one main stem node every 3.7 days after the first trifoliolate appears until seed development begins. A node is where the flowers, then pods, then seeds in those pods are produced. The crop needs enough seasonal time to produce as many main stem nodes as possible. Delay planting by one week (seven days), and your crop just lost an opportunity to have two nodes on its main stem.